HostSoch Review 2019: Is HostSoch a Good Hosting? Hostsoch offers pocket-friendly web hosting services to businesses of all sizes in India and beyond. With their industry-leading customer service and features, it’s no surprise that they’re now one of the fastest-growing web hosting companies in the country. Hostsoch was founded in 2012 with a mission to offer affordable web hosting services to small to mid-sized businesses in India and beyond. With their industry-leading customer service and features, it’s no surprise that they’re now one of the fastest-growing web hosting companies in the country. Currently, their website is only available in English. Hostsoch offers shared hosting on both Linux and Windows-based servers, specialized CMS hosting, and dedicated servers. They have four standard packages in each hosting category: Starter, Advanced, Business, and Pro. One of the best perks of Hostsoch is that they offer unlimited resources with their Advanced plans and above; the main variation in the plans beyond that point is the number of websites you can host per account. Like many shared hosting providers, Hostsoch’s packages include a one-click installer supporting the most popular scripts, such as WordPress, Joomla!, Magento, and 300+ other applications. This makes them a fairly beginner-friendly choice. Their Linux hosting plans come with cPanel, while their Windows hosting plans are accompanied by a Plesk control panel. Those choosing their WordPress hosting plans will be happy to know that Hostsoch has invested into a Cloudflare CDN for their servers; this means faster website loading times, no matter where your visitors may be located. 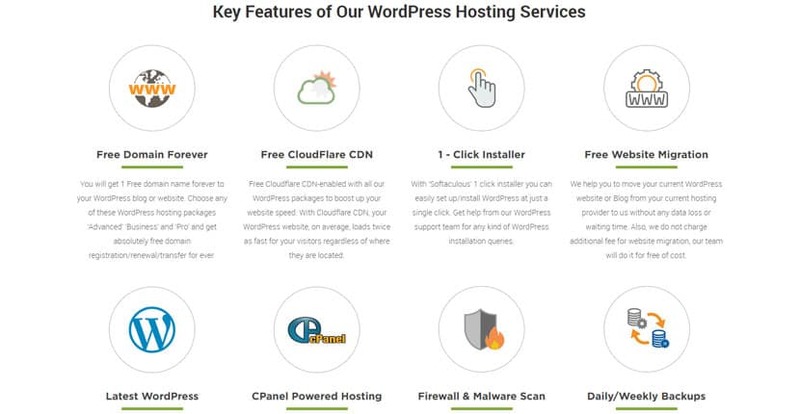 Users of their WordPress hosting packages will find their accounts pre-loaded with the latest version of WordPress and an automatic daily backup system; clearly, they’ve tried to make their platform as easy-to-use as possible. Hostsoch provides a 99.9% uptime guarantee on any hosting plan you purchase from them, along with a free lifetime domain registration with their Advanced plans or above. A quick test with Uptime Robot yielded an average uptime of 99.91% for the last quarter, which means that they’ve definitely been living up to their promises. These are noteworthy features particularly for an Indian web hosting company as most other Indian shared hosting services generally can’t sustain such high levels of uptime, and the industry standard is to offer only the first year of a domain registration for free. Unfortunately, none of their plans include SSL certificates, so you’ll have to purchase these separately. Considering the features they include with their packages, I can see why Hostsoch has become such a popular choice; they’re a budget-friendly host that’s made it a point to help beginners get started quickly with their first websites. They don’t have any free plans available, but I’m not perturbed – especially considering that they include a free domain registration for the entire lifetime of most of their hosting plans (the yearly cost of registering a domain can easily be a sizable portion of the annual cost of your hosting plan). I was equally pleased to discover that unlike most web hosts, Hostsoch doesn’t significantly increase their prices upon the renewal of your hosting plan. Whatever you’re paying at the beginning will be the amount you’ll pay when renewing your package. I was a little disappointed that they didn’t offer any sort of money back guarantee, however. One area in which they could improve is in the jump between shared and dedicated server hosting. At this point, they don’t offer VPS or cloud hosting packages. This means that if you’ve outgrown a shared server but can’t quite afford one of their dedicated servers yet, you’re out of luck. Thankfully, Hostsoch has an excellent customer support team, so they may be able to help you find an alternative. They’re available 24/7 via live chat, tickets, and email. In my experience, they’re personable, accommodating, and knowledgeable. They’ve always responded to my queries promptly, and I didn’t have any issues communicating with the team even though the company is based in India. Hostsoch is an excellent choice for SMB’s in India looking to establish their first company website – or perhaps shift over from a different hosting provider. However, their lack of VPS and cloud hosting packages may prove problematic for rapidly-expanding startups. Wondering how HostSoch stacks up against other Web Hosting companies? Enter any other Web Hosting company and we will give you a side-by-side comparison.